The temperatures are rising, the snow is melting and Spring is budding in the West. It’s never easy saying goodbye to Father Winter, but alas, we must. Your days on the slopes may be over for the season – and the brown pow may feel like it will never come – but don’t fret, dear mountain enthusiast. Take some time this mud season to relax and decompress by getting your soak on at these pristine, out-of-the way Colorado hot springs. These natural hot tubs are well worth the effort – we promise. 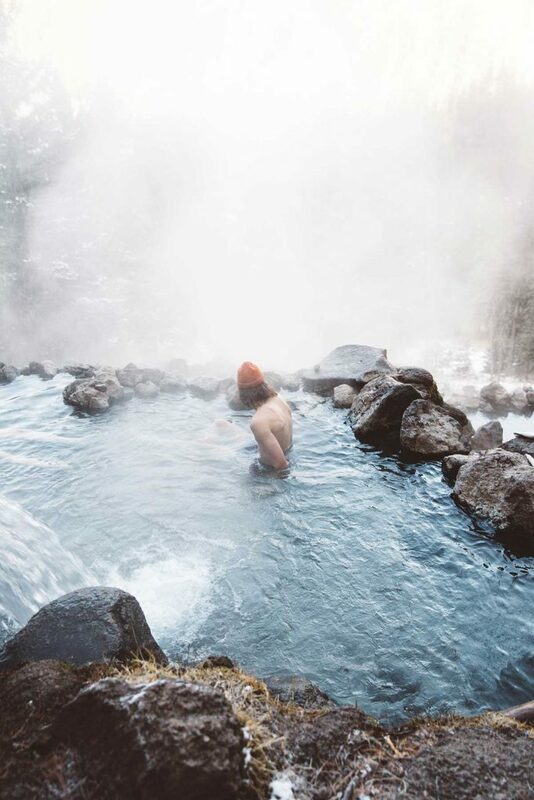 Some people enjoy the easy accessibility of commercial hot springs and we really can’t blame them. When you’re looking for a quick dip (and don’t mind sharing the pool with the masses), Colorado has more than its share of amazing spa-like natural springs with all of the implied creature comforts. If you’re in search of an experience that is a little more authentic, Rainbow is the way to go. While these natural hot springs are alone worth the trip, the hike to reach them is absolutely spectacular. A moderately-traveled 10-mile out-and-back trek, this journey through pine and aspen groves in the San Juan National Forest is sure to leave you breathless – and not just because of the 1,000-foot elevation gain. This all-day undertaking can be somewhat treacherous at times: tough climbs, steep edges and (unfortunately) fire-ravaged fallen trees certainly add to the adventure. The impressive overlooks, rushing waterfalls and enchanted forest scenery, however, more than make up for the effort. Be sure to take your time and revel in the sights along the way. After the long but rewarding hike in, these hot springs are the perfect salve for tired muscles. Soak at your leisure in this high-alpine mecca – and fully relax knowing that the way home is downhill. If you’re not quite in the mood for a serious hike but are craving an all-natural soak, Radium Hot Springs are a great, convenient option. Located near Bond, Colorado, this moderate 3-mile loop trail features beautiful hot springs right next to the Colorado River. Frequented by locals but relatively secluded in the Spring, this hot spot provides gorgeous views of the surrounding cliffs and mesas. Since the pools are technically attached to the river, it’s best to visit these hot springs before the Summer snowmelt raises the river. As logic dictates: the higher the river, the cooler the pools. Good luck finding somewhere better than Conundrum Creek Valley if you’re looking for a high-alpine hot springs adventure. Boasting wildlife such as bighorn sheep, moose, mountain goats and black bears, the Conundrum Creek Trail (located in the Maroon Bells-Snowmass Wilderness between Aspen and Crested Butte) reaches 11,200 feet into the mountains. This 16.7-mile out-and-back trail through lush alpine meadows, aspen forests and wide-open valleys can be done in a day, but why rush such magnificent views? Since the relatively intense 8.5-mile hike in involves a 2,500-foot gain in elevation, it makes sense to take your time and spend the night under the Colorado stars. Be advised, overnight camping permits are required and a three-night maximum (June 1st – September 1st) is enforced. Surrounded by Cathedral Peak, Conundrum Peak and Castle Peak, this pristine hot spot oasis has two main pools and four smaller springs, all hovering around 100°. As is true at many Colorado hot springs, clothing is optional, so go in prepared for that eventuality. Like the return hike from Rainbow Hot Springs, the hike back to the trailhead is (thankfully) a downhill journey. However, beware: after a couple of days soaking up nature’s high-altitude beauty, you may never want to leave. While these three Colorado hot springs are by no means the only options for a secluded soak, they represent some of the best wild pools the state has to offer. Whether you’re gearing up for a daytrip or packing for an overnight stay, remember that it’s always better to be over-prepared than under – and that following the tenants of Leave No Trace keeps these majestic spaces pristine for the next generation. So, what are you waiting for? Grab your gear, lace up your hiking boots, and don’t forget your towel! We can’t wait to hear about your next adventure.